Located ten miles from the Pensacola Regional Airport and within minutes to downtown Pensacola, Pensacola Beach and golf courses, the Garden Inn and Suites Pensacola FL Hotel is ideal for leisure and business travelers seeking both tranquility of a peaceful environment and the convenient accessibility to various city venues. Garden Inn and Suites Pensacola Hotel is an affordable lodging option in the greater region of Pensacola Florida Hotel. Comfortable and spacious guest rooms of Garden Inn and Suites Pensacola Hotel offers an array of modern amenities for the convenience of hotel guests. Each guest room features Cable TV w/HBO in addition to the standard room amenities. Wake-up service. Garden Inn and Suites Pensacola FL Hotel provides complimentary breakfast and complimentary in-room coffee service for the convenience of hotel patrons. The Southern Kitchen, located onsite at Garden Inn and Suites Pensacola Florida Hotel, serves delicious American cuisine for breakfast, lunch and dinner. Foxx Landing, the hotel's lounge has live entertainment, offers a relaxing atmosphere and a great selection of beverages and snacks in the evenings. 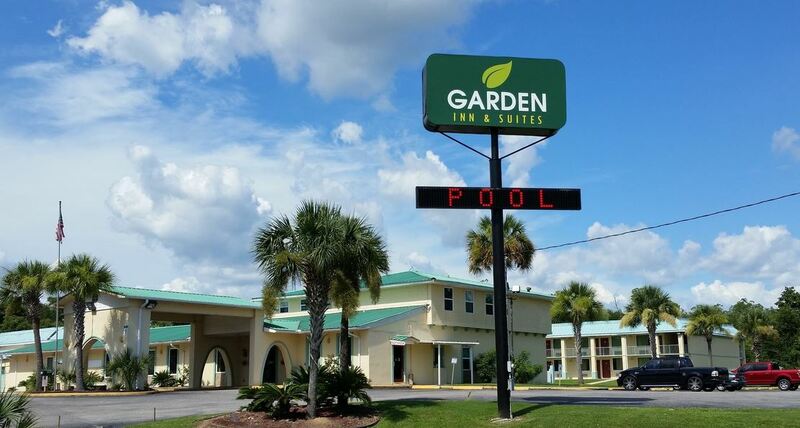 Garden Inn and Suites Pensacola Hotel is within easily accessible distance to various Pensacola attractions, including the Five Flags Speedway, American AM Golf Classic, Cordova Mall, Greyhound Racetrack, Museum of Natural History, Naval Air Station, Snowball Derby and Seville Quarter. The convenience, comfort and affordability of Garden Inn and Suites Pensacola Florida Hotel, combines to ensure the hotel's success as an ideal accommodation facility for all travelers arriving in Pensacola.